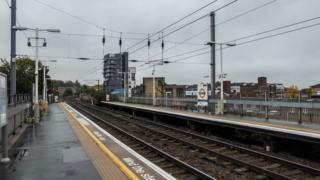 Two people found dead on train tracks are thought to have been electrocuted, police have said. The first victim was found after police were called to the line between Hackney Wick and Stratford, east London, at about 01:00 GMT. About 90 minutes later, the second person was found, having sustained "serious injuries consistent with electrocution". British Transport Police (BTP) said one victim was a man in his 20s. Officers believe the deaths are linked and are working to establish the identity of the second victim, a spokeswoman said. A BTP spokesman confirmed they were investigating whether the victims were graffiti artists or "train surfers" as "open lines of inquiry', although there is no any evidence to suggest this yet. There were minor delays between Stratford and Richmond/Clapham Junction while police carried out an investigation. Disruption has now been cleared. Det Ch Insp Tim Tubbs said: "An investigation is now under way to discover what happened and how these two people came to lose their lives on the railway. "At this time we are treating their deaths as unexplained as we make a number of urgent inquiries. I would ask anyone who was near Stratford or Hackney Wick last night, and saw something which they think might be relevant to contact us as soon as possible."